Here is a fun little morsel that I put together tonight when I was looking for something to snack on, but didn’t want to cook anything. As a bachelor, I am constantly moving back and forth over the line of ‘to cook my food or to not cook my food’. I don’t have a family or significant other to cook for, so often times I’ve really got to be inspired to cook anything of note. The times I don’t cook, I’ll either just grab a bowl of cereal for dinner, or polish off a bag of Tostitos with a bowl of salsa, and maybe an apple so I can feel good about my decisions (don’t judge me). When I come home from work and don’t want to do anything because my brain is mashed potatoes, there’s nothing wrong with a bowl of Ramen and a stick of string cheese. But then there are other times when culinary creativity strikes, but the need to go grocery shopping is close at hand and only remnants of what was once a plethora of choice cuisine remain. It is in these times that bachelor creativity has the potential to shine the brightest! With only a few items in the cupboard and a willingness to try something new, things like this little jewell tend to emerge. There’s not much else to say about it, so I’ll just call it what it is. 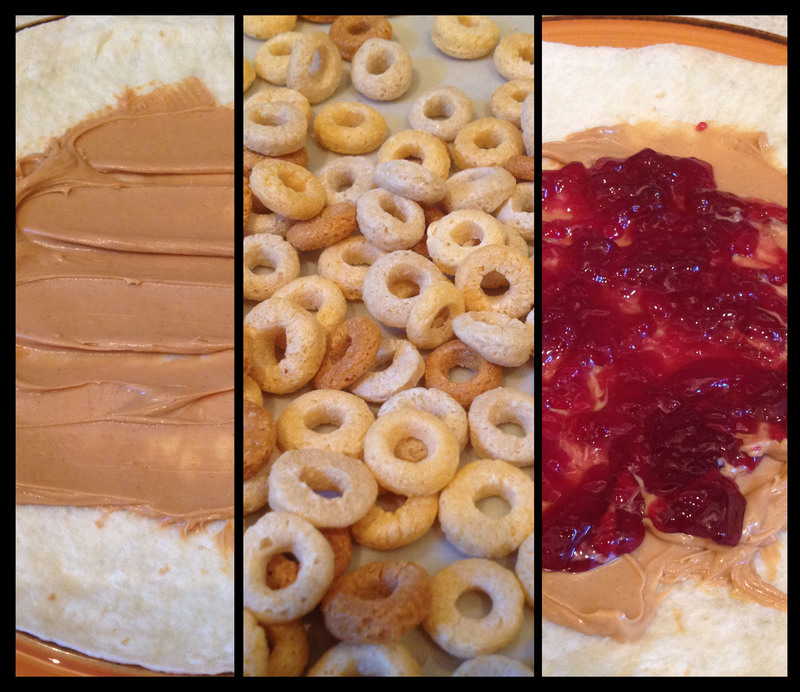 The peanut butter, jelly, and Cheerio burrito. I had in my cabinet a jar of creamy peanut butter, a box of cereal, and a package of tortillas. I took the jelly from the fridge and thought to myself, if I can enjoy a peanut butter and jelly sandwich, I’ll bet I can also enjoy a peanut butter and jelly burrito! But then I realized that that would just be a tortilla filled with goop. Delicious goop, but goop nonetheless. So I looked to my Cheerios to lend their substance to the otherwise formless and squishy concoction. I know, I know, it sounds weird, but it’s a simple and delicious little snack wrap that’s both satisfying and healthy … well, at least satisfying! Incidentally, this is also a great portable snack to load up for kids on day trips and what not … probably. Just wrap it up in plastic or foil or something and it’s good to go! There ya go. If you would like to try your hand at this strangely delicious spectacle of culinary oddity, you can find a “recipe” in the recipes section of the blog. This morning, I had the pleasure of waking up to a roaring and rumbling thunder storm. In my experience, there’s almost nothing quite as enjoyable as waking up to thunderstorm at 7:30 on a Sunday morning and simply laying in bed enjoying the sound of the thunder and the rain, especially since I didn’t have to be anywhere for the next few hours. An additional joy of a nice spring thunder storm is the peaceful weather it leaves in its wake. This weather just happens to be perfect for grilling out! The thunderstorm passed and the day went on, and upon the arrival of dinner time I decided it necessary to grill a steak. In my last post, I mentioned the purchase of a new house. This house just happened to come with a brick charcoal grill in the back yard. Now anyone who’s ever used a charcoal grill before knows that when you light up the coals, you can’t JUST grill one steak. 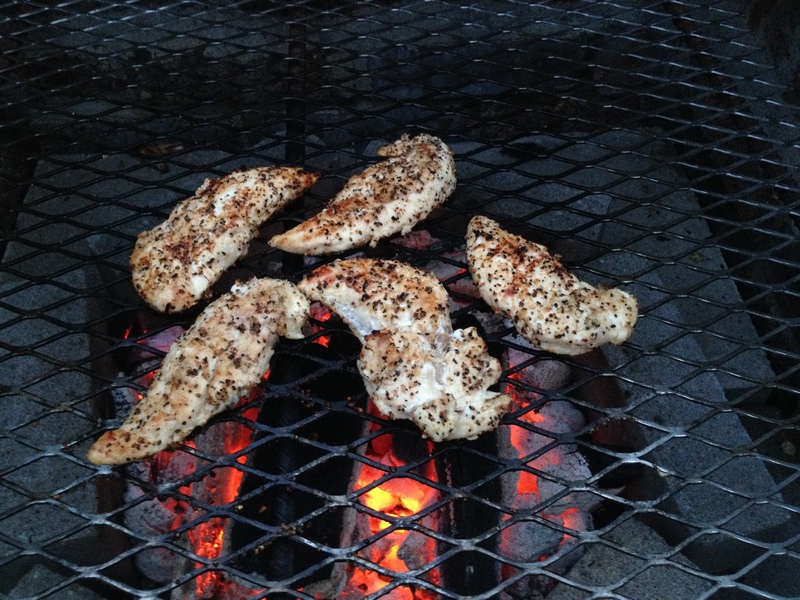 Unlike their gas counterparts, you cannot simply turn off a charcoal grill when you’re done with it, so you might as well utilize it while it’s hot. 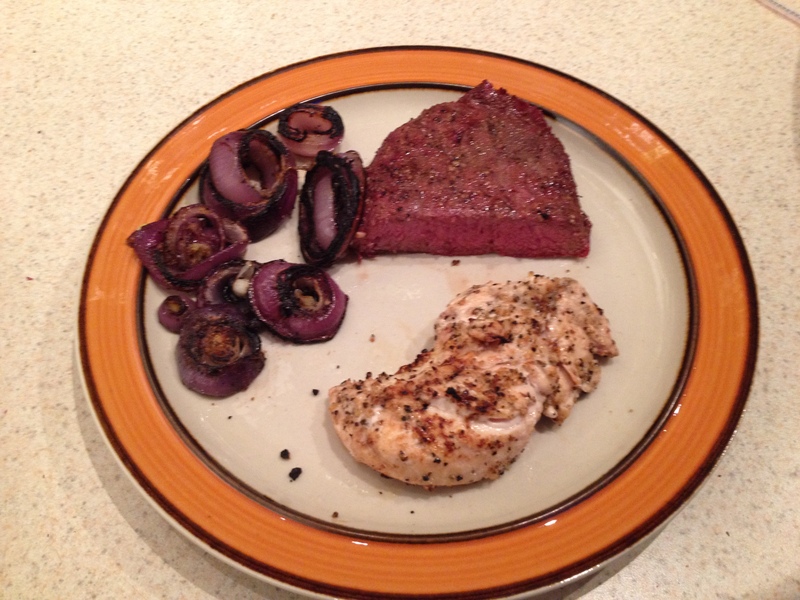 So my one steak turned into a steak, some seasoned onion rings, and lemon pepper chicken. I’ve mentioned before that some for the food I prepare is pretty tasty, but tonight’s selection from the grill easily takes the cake. At the risk of sounding full of myself, I can cook some very tasty food. Tonight, however, I blew my own expectations completely out of the water. As I was eating what I’d just taken off the grill, I was so overwhelmed by the goodness of what I was tasting that I had to stop and raise my arms in the air as if I had just scored a touchdown. I thought to myself, how is this so good – and then I thought of all of you. You have to try this! It was, simply put, amazing. If you have a charcoal grill, light it up tonight and take these simple yet incredible recipes for a spin. I promise you, you won’t regret it. Oh, and invite your friends, neighbors, family, coworkers – whoever. Upon tasting this, you will have an overwhelming urge to share your creation with everyone you know! Yes, it’s that good. I have been absent for a spell … again. But I have an excuse! I recently bought a house! I’ve been working on it for the past two months getting it into shape and making it a home, and I finally feel that I can call my new house my new home. The predominant reason this is so is because I can now enjoyably use the kitchen and it feels like mine. It’s clean, it’s large enough to move around in, and everything has a home when I’m done with it. It’s marvelous! This evenings fare is chicken & rice. It’s a very simple dish. 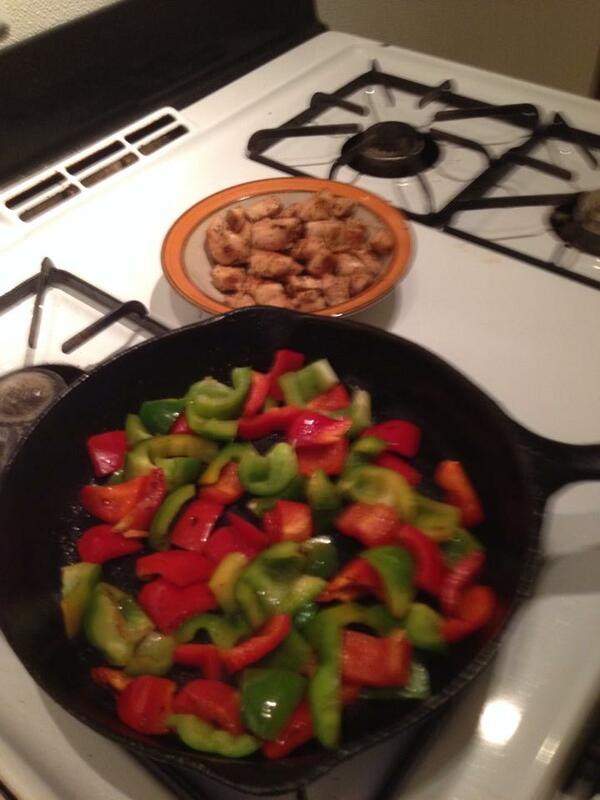 Seasoned chicken, blackened bell peppers, and brown rice. It’s cheap, it’s easy, it’s relatively quick, what more could you ask for? Plus, if you do it right, your whole house will smell of deliciousness when you’re done. If you’d like to try this simple, yet satisfying selection, you can find a recipe in the recipes section of the blog. Oh, and by the way, this is an excellent base to start with to create your own masterpiece. If you want something a little more gooey and savory, you might add some cream of (whatever) soup and some cheese. Or if you’re feeling a little more exotic, you can spice it up with some mango, pineapple, and a hot pepper or two. You could turn this into a chili or a soup. The possibilities are endless! 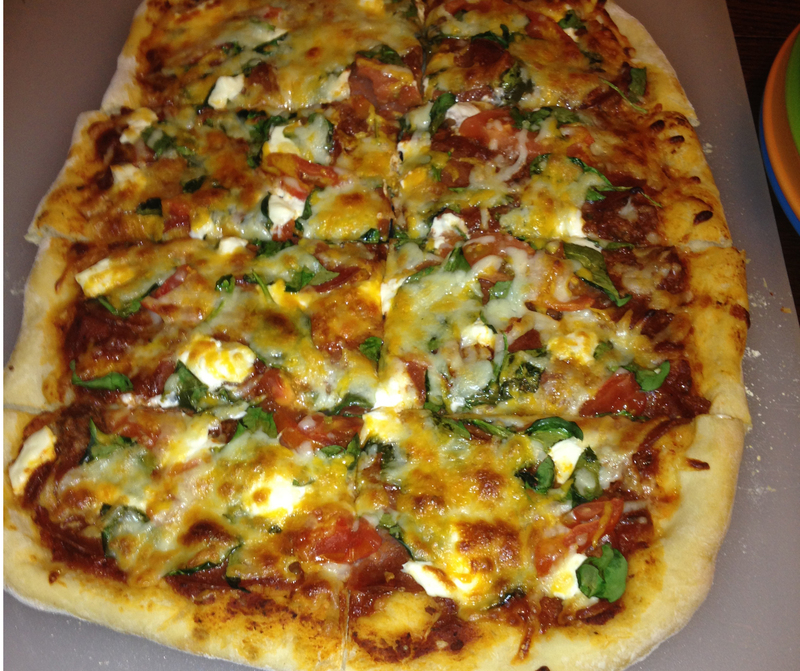 There’s a certain sense of accomplishment that comes with pulling a freshly baked homemade pizza out of the oven. 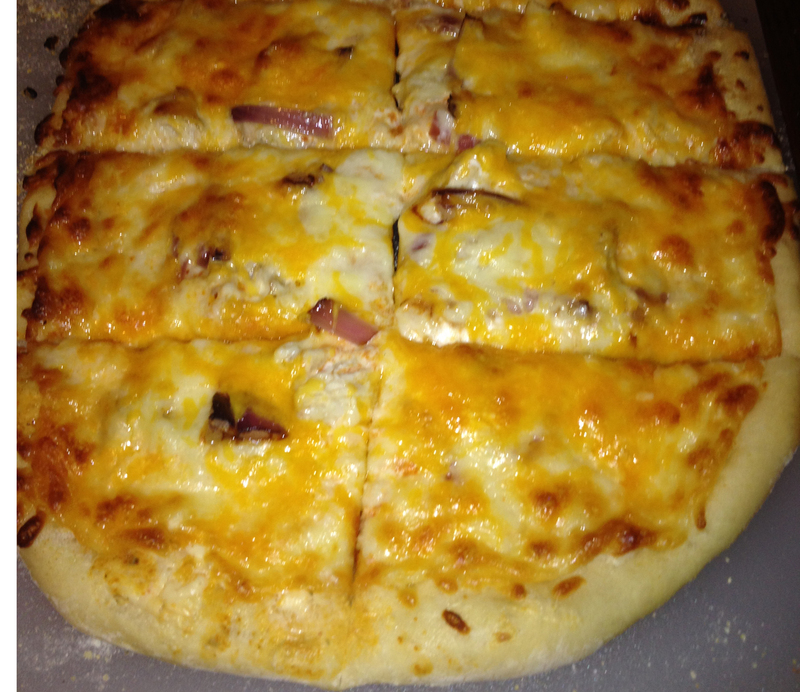 Even though it may have taken much longer to put together and bake than it would to simply order a pizza from down the street, the satisfaction of creating yourself what you might pay twenty dollars (or more) for a pizza place to make for you is worth it. It’s just as much about the experience as it is about the pizza. And what better way to capture the homemade pizza feeling than with good friends. This is what’s known by some as the “pizza night”. To pull off a pizza night well, you need to have four foundational key ingredients: Good friends, an accommodating oven, beer, and – of course – pizza. If you feel like you’re up for the task of the advanced pizza night, you can add a playlist of your favorite music to augment the environment in whatever direction you choose – we chose to bring in a little bit of the 80’s. something about hair bands and pizza just feels right. If you want to go all the way and dial up your pizza night to eleven, you can do all the above while sporting an apron and toque. But, as the point of a pizza night is ultimately the pie, let’s talk za. A good pizza starts with a good pizza dough. 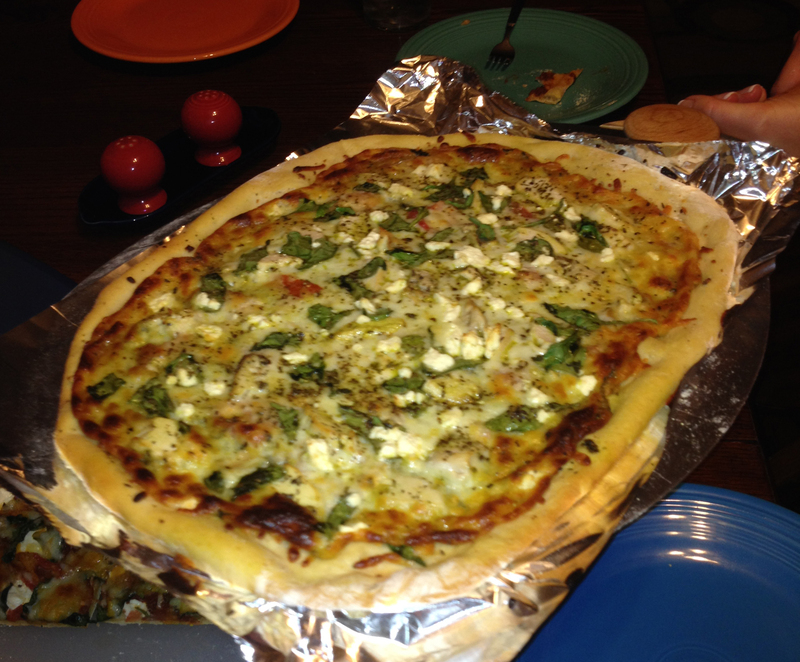 We made enough dough to create five pizzas (and by we, I mean my friend the baker). You can find all kinds of simple recipes online – like this one – but I’ve been told that the best pizza crust is made with a sourdough base, which is a bit more involved, from what I understand. After the crust, the rest is really open for interpretation. You could use all kinds of different sauces, such as pesto, Alfredo, garlic, sweet tomato, savory marinara, anything you can spread really. You could even use ketchup & mustard if you wanted, though I would urge you in the name foodies everywhere – please don’t. From this point forward, anything is fair game. If you can eat it, you can put it on a pizza! 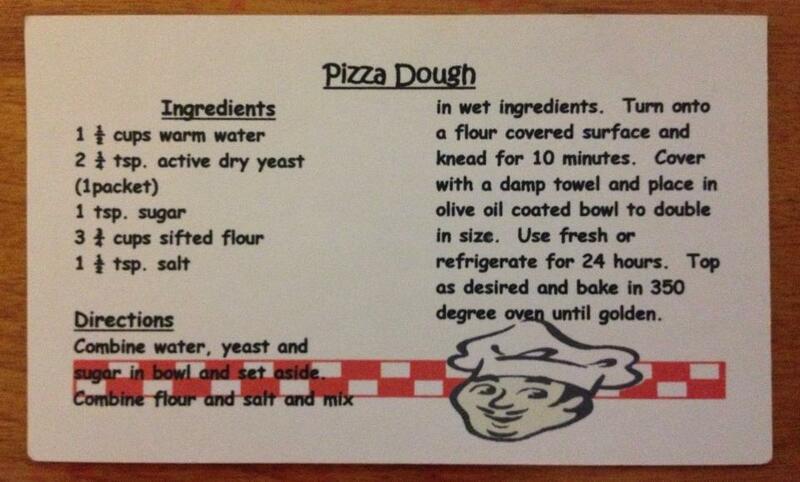 I’ll include ingredient lists for the five pizzas we created. As always, if you’d like to join me and recreate the wonderment for yourself, you can find a recipe in the recipes section of the blog. First let me acknowledge that it’s been a while since I’ve posted, and for that, I apologize. I’ve had more life and less food happening lately. But it’s good. Lessons have been learned, growth has been achieved. What’s life without a few bumps right? Anyhow, it’s been getting cooler around here lately, and so the other day, I decided to make a batch of chili. Truly one of the simplest meals to make, chili is an art form. Often times the best chili is impossible to reproduce, making every great chili one of a kind. 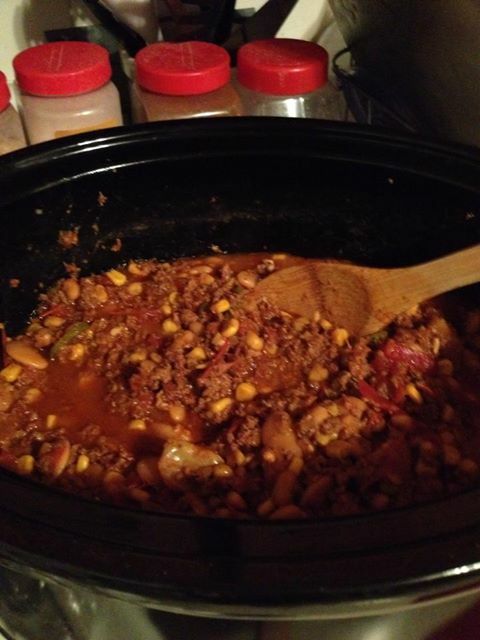 All one needs to make a memorable chili is a crockpot, some cumin, and enough ingredients to fill in the rest. Like I said, it’s not hard, and if you’re creative, you can make some interesting flavors, as you can make chili out of just about anything! I’ve been known at my company’s annual chili cook-off to make some of the tastiest chili in the line up. I remember one year I made what I called White Fire Chili. It was a white chicken chili with plenty of jalapeños and black pepper. That was my first foray into the chili arena. Another year I made a Black Mango Chipotle Chili, for which I “roasted” my own peppers and garlic on a charcoal grill. I say “roasted” because I left them on for a bit to long, and my peppers were a more blackened than I had intended intended. But they still had plenty of heat! Combined with a couple mangos, it made for a delicious sweet and savory spice. Another year I made a Buffalo Chicken Chili. That was a good one! I even made my own Buffalo sauce. Fact: Buffalo sauce is almost half butter. A year later, I made a Spicy Chipotle Chili. I think that was by far the hottest chili I’ve made to date. I decided to outsource my chipotle peppers after my last attempt at roasting peppers, and with two cans of roasted chipotle peppers, a few habaneros, and plenty of garlic & cumin, it had a hefty kick, but it was so tasty the pain was well worth it! This time, the decision to make chili was a last minute one, and so I just used what I had on hand (with a little help from friend). I was making it for my church small group, so I couldn’t give it too much of a kick. It wasn’t my best chili, but it was still pretty good. It was simple enough that it may be reproducible. A simple tomato based chili with ground turkey, beans, and a few hot peppers to give it some tingle, it’s a lean but delicious concoction. I’ll drop a recipe in the recipes section of the blog. You can try it for yourself, or you can use my recipe as a launch pad to prefect your own one or a kind creation! What is the best chili you’ve ever made or tasted? Drop a note in the comments below! Every once in a while, on my way to work I’ll swing by McDonald’s and get a couple of their sausage burritos for breakfast. They’re small, but they’re only a buck. The only issue (well, one of the issues) is that while it seems like a simple burrito – just sausage, cheese, eggs & peppers, I don’t really know what all is in there. I’m guessing that there’s a pretty good amount preservatives and fat in there that wouldn’t be there if I were to make my own. I know I said a good burrito doesn’t need a plate, but for the sake of showing the burrito innards, I’ve used a plate. This got me to thinking. What if I just made a bunch of my own burritos and froze them. Then I could just pop one into the microwave before I leave for work, and voila! Instant breakfast! And that’s what I did. Instead of using pork sausage, which naturally has a high fat content, I used ground turkey. It’s surprising, ground turkey, when it’s browned, has almost the exact same texture as hamburger. It tastes a bit different, but not much. Plus it’s naturally something like 95% lean. 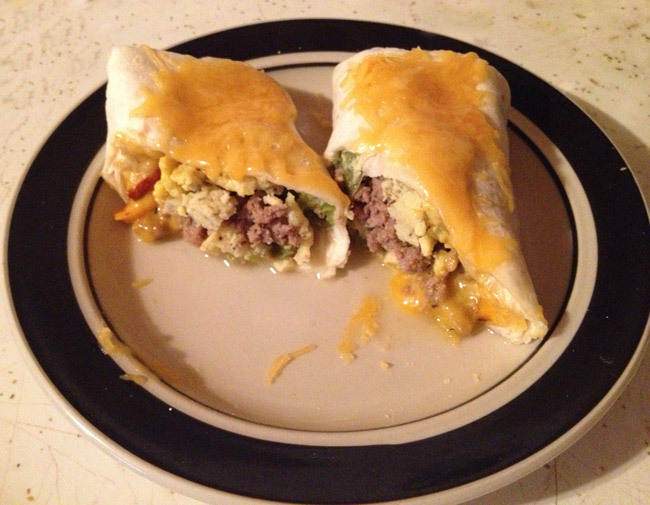 With the ground turkey, I used eggs, onions, green peppers, jalapenos, and shredded mild cheddar. It took about an hour and a half to cook everything and fold and wrap the burritos, but it was worth it. Sixteen frozen breakfast burritos can last quite a long time. On a side note, about year ago, I was eating at Taco Bell fairly regularly, and as I would wait for them to prepare my order, I would watch them speedily fold their burritos. From that consistent and regular observation, I was able reverse-engineer their burrito fold and copy it. This method – I call it the air-tight seven fold burrito – makes sure that everything that’s inside the burrito stays inside the burrito. I’ve found it to be very effective. I’ve illustrated it for you, so you too can fold burritos like a boss! If this idea has you inspired to do the same, you can find the recipe on the recipes section of the blog. 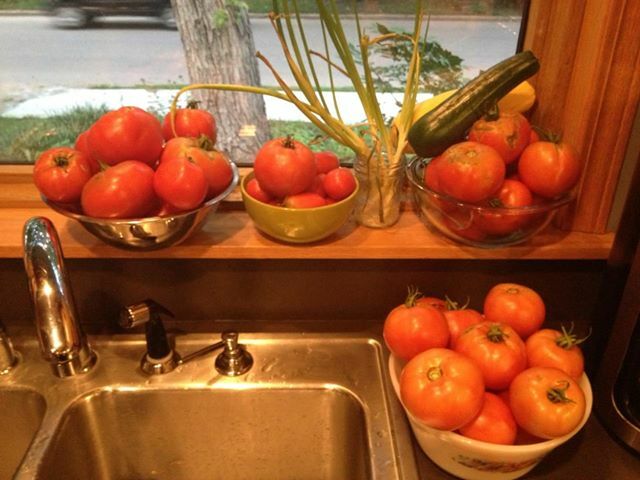 Here in Kansas, it is apparently tomato season. Let me be more specific. It is apparently freakishly high-yield tomato season. We’ve had about a month of arid, relatively hot weather, with almost no rain or precipitation of any kind. Everything was really dry. Those with gardens were having to fight with every hose they had to keep the things alive. That dry spell finally came to a close, and with a welcome deluge it rained for 3 days straight and since has rained on average one out of every three days. The result of this has been all the tomato plants that were fighting just to stay green have now starting producing tomatoes like they’re going out of style. It’s wonderful!! My friend’s garden, which only has three tomato plants, has produced enough tomatoes to feed 4 different families and me! Here’s a little secret about tomatoes – well, it’s not really a secret, just something some of you might not be aware of. Tomatoes that you get in the store are not actually ripe. It’s true. Most of the tomatoes that you find in the grocery store are picked while they’re still green by illegal and often times enslaved immigrants and then shipped to their destinations. In route, the tomato container is saturated with a gas called ethylene, which causes the tomatoes to turn red. It doesn’t make them ripe, just red. That’s why most of the tomatoes you buy at the store taste like they’re not ripe. Because they’re not! Anyway, with home grown, delicious, ripe garden fresh tomatoes, recipe’s take on a whole new character and explode with flavor and color! With the tomatoes I received from Tomato Lady, I made up a batch of simple spaghetti sauce. Only 4 ingredients plus spices, but oh the flavor! 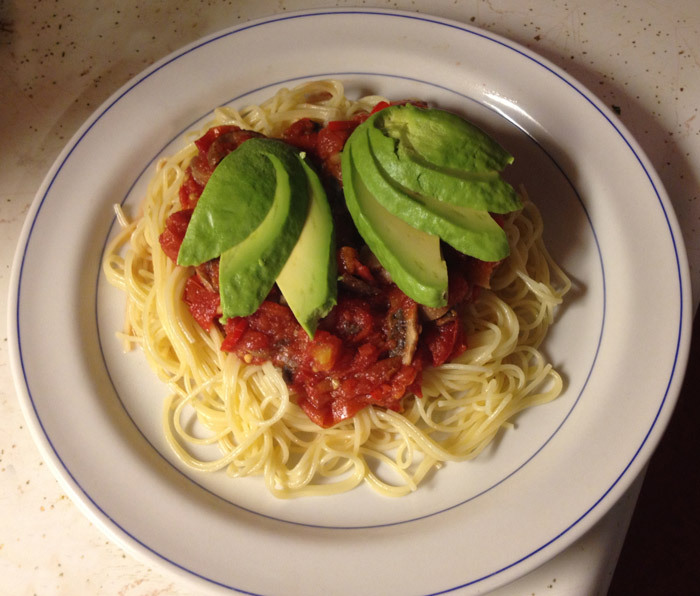 Combine that with a plate of angel hair pasta, top with an avocado, and you’ve got a wonderful meal! If you’d like to try this for yourself, you can find the recipe in the recipes section of the blog. Today is August 6th, and it is my birthday. It marks the beginning of my 4th decade. It was filled with well-wishing friends and Facebook messages from people I haven’t seen for years. I even got flowers from a friend. It can be argued that a friendship is resting on pretty solid ground when flowers can freely be exchanged. Anyway, there were many things about today that were really fantastic, but it is yesterday evening that will be the focus of this post. On top of receiving a wonderful pre-birthday birthday cake filled with chocolate cake, ice cream, and love – upon which I will reflect a bit later – I also experimented with something I’ve never tried before … and it was a smashing success! Yesterday was, of course, Monday. 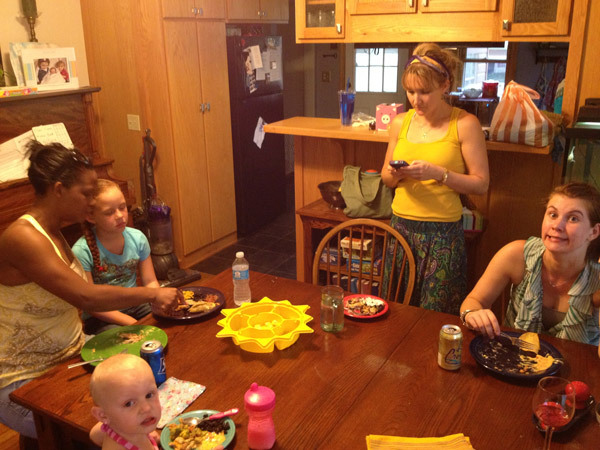 That meant I was hosting the weekly Monday night dinner group with a good friend. As I was thinking of what we could offer our attendees this week, I thought it to be a good idea to fire up the grill and make some cheeseburgers. However, having just recently finished an uber-healthy diet, I didn’t really want something terribly fatty and heavy like greasy, cheesy grilled beef, delicious though it is. What came next was the inspiration for a concoction not yet tried, or even dreamt of in my culinary repertoire. A fusion between grilled summery deliciousness, and lean, relatively healthy poultry; the turkey burger! The idea was sound. I’d start with ground turkey, add some diced red bell pepper, minced onion and garlic, finely shredded zucchini and yellow squash, and fresh minced chili pepper, and season it with a little lemon-pepper and salt. This would make for a juicy and delicious – not to mention healthy – beef burger substitute. There was, however, a hick up. After I’d added all these wonderful fiber-filled ingredients to the already goopy ground turkey, the mixture became somewhat … schmoopy. This stuff was just as likely to stick to my hands as it was to stick to itself, which made forming it into patties somewhat difficult. It also had a slightly runny quality to it, so it might likely run through the rack on the grill before it had time to set up over the heat of the flames, rendering it somewhat less than appetizing. 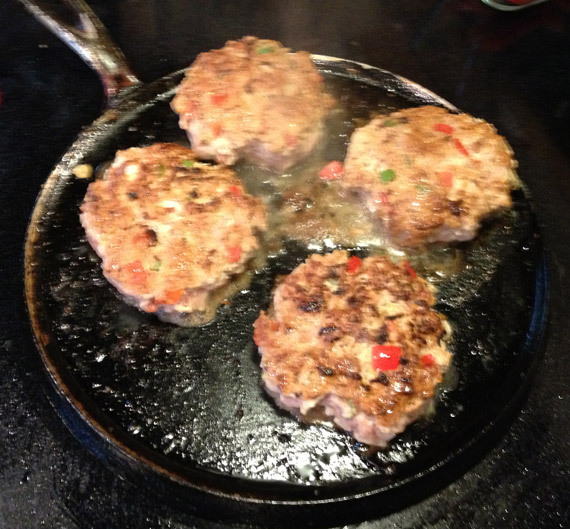 my friend, possessing an unparalleled brilliance, quickly suggested that we form the patties and give them a little more cohesion with a skillet on the stove before moving them to the grill. Like I said… Brilliant! So that’s what we did. 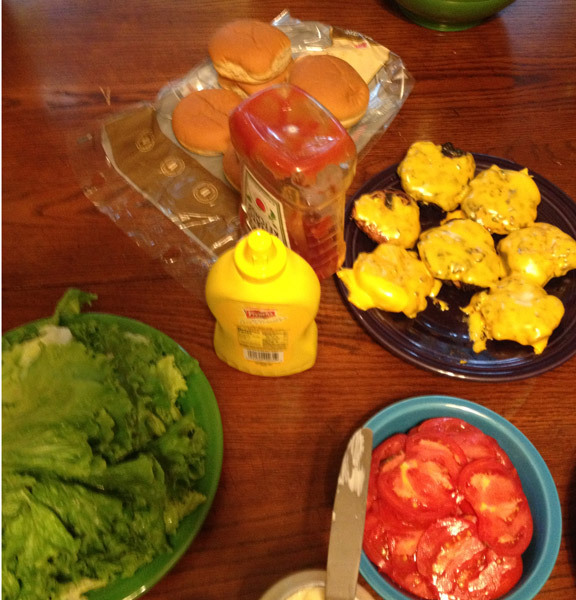 In a magnificent display of teamwork, she formed and firmed the patties, and I grilled them up to perfection. Add a little cheese, slap ’em on a wheat bun with some green leaf lettuce and fresh-from-the-garden sliced tomatoes (so good! 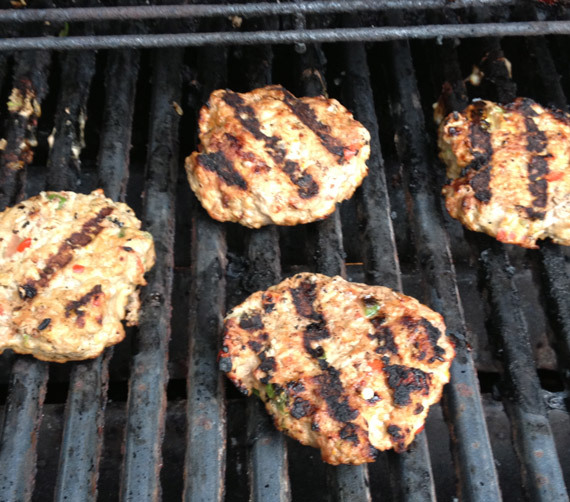 ), and what you’ve got is a juicy, tender, delicious, absolutely mouthwatering turkey burger! It doesn’t happen very often, but I was astounded at how wonderfully these little poultry patties turned out (if you’d like to try these turkey burgers for yourself, you can find the recipe over in the recipes section of the blog). Add a delicious garden salad, and a spectacular fruit salad – both provided by our guests – and these simple turkey burgers turned into a splendid meal. But of course, as the evening progressed, the splendidness increased all the more as I was informed that there was still dessert to be had in the form of an ice cream cake. Being the sharp individual that I am, I quickly deduced that this must be a birthday cake. My birthday cake. An unexpected, but not unwelcome surprise! It was delicious. Not too much cake, not too much ice cream, but a perfect balance between the two, with a creamy chocolate sauce spread lightly beneath a thin crispy chocolate shell. All the textures and tastes blended seamlessly to make one of the best ice cream cakes I’d even had. Reflecting on this and looking back on my 29 previous celebrations, of all the birthday shenanigans and all the parties thrown on my behalf, I think this one was, quite decidedly, the best. It wasn’t top on the list because of an eloquent speech, a grandiose gesture, or even a generous gift. The reason for this one taking the cake, as it were, is simply the fact that it was simple. It was just a cake and a song. That’s it. I am, by nature, an introvert, and being such, I naturally tend to draw back from being the center of attention. Birthday parties, where the soul purpose of the gathering is to focus all attention on me, have always made me a bit uncomfortable. I’m a listener, an observer. When everyone is listening to and observing me, I feel somehow forced to be someone that I’m not, expected to entertain or become the life of the party. But this birthday celebration, a simple ice cream cake, was perfect. 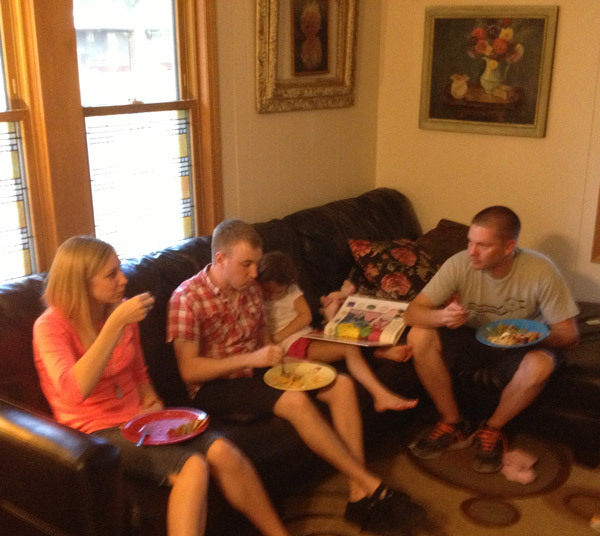 All of us were there, not to celebrate my birthday, but simply to be together for dinner and some friendly discussion. My becoming a year older was brought up, acknowledged and celebrated, and then we moved on. That’s really all I need, to be acknowledged, to be seen. Anything more is getting into territory that, for me, is reserved for my more intimate and close relationships. Although the cake and the song may have felt to some like an insufficient tribute to the occasion, rest assured and be encouraged, it was exactly what I wanted. And I am deeply grateful. Thank you. Yesterday I emerged, relatively unscathed, from the fruit and vegetable desert! The trek was long, the terrain difficult, but the journey has at long last come to an end. To celebrate this momentous occasion, my good friend who was in the desert with me, threw a grand party, featuring her culinary acuity in the form of delicious gooey cheesy chicken enchiladas! And oh my word they were quite possibly the best gooey cheesy chicken enchiladas I’ve ever had in my 30 years of existence! They were exquisite! But in the process of celebrating the departure of my dietary restrictions, I also found myself celebrating and greatly appreciating the community that I’ve come to be a part of. Because, as you may know, the quality of our lives is not determined by the possessions we acquire, the delicacies we consume, or the wealth we accumulate, but by the friends we pick up along the way and the life we experience by their side. Without people to share all the treasures and pleasures of life with, it all can quickly become empty or hallow. As I looked around the room and saw friends gathered, if for no other reason than to share a meal together and help three of their friends mark the end of a season of self-imposed difficulty, it hit me afresh: my friendships, the people I love, admire and respect are so incredibly important to me! There have been many times in my past, some more recent than others, where I’ve felt like I was on the outside of community looking in. It’s those times that help me to appreciate what I have here and now. I’m part of a community that cares for one another, encourages one another. We celebrate together, laugh together, and even cry together. It’s a beautiful thing. Life is meant to be shared. There’s no getting around that. We were all, all of us, created to be in community. When we’re not doing that, we’re leaving behind and neglecting a vital part of who we are, letting an important piece of what it means to be human atrophy. The best part of being alive is being alive with other people, and the best part of eating great food, is sharing it with the people you love. So I’d like to drop a few names. Keisha, Ben, Kenee, Catherine, Katie, Vickie, Livie, even though I don’t see some of you as much as I might like, you are all excellent people and I am filled with gratitude that you number me among your friends. Even though the enchiladas were of the highest calibre I’ve tasted, it was the company that made the evening such a great gathering. So you, whoever you are reading this right now, I sincerely hope that you know the blessings of community and friendship. Because without it, even something as enjoyable as great food can lose it’s worth. Food without the life around it is merely sustenance. In order to truly enjoy great food, you need great people to enjoy it with. It’s Life. Plus food! I’m down to the home stretch. I can see the light at the end of the tunnel. Only a few more days in this vegetable desert! But for now, I’m still here, and I’ve gotta eat. So I’m still trying to mix things up a bit. Though at this point, everything is starting to taste the same. My mouth is watering as I think about what’s coming. My friend, whom I’m walking in this desert with, will be cooking cheesy chicken enchiladas to celebrate the end of our diet. You better believe I will thoroughly enjoy them! I can almost taste their melty gooey cheesy goodness right now! I will, for sure, include a recipe for my own cheesy enchiladas when I make some for myself. As absolutely delicious as they are, they are extremely simple to prepare. You can watch for that. For now, seeing as how my culinary canon is still in effect, I’m going to attempt to recreate a staple of any family’s dinner menu – spaghetti. “But you can’t have pasta!” you might be screaming right now. And you’re absolutely right. 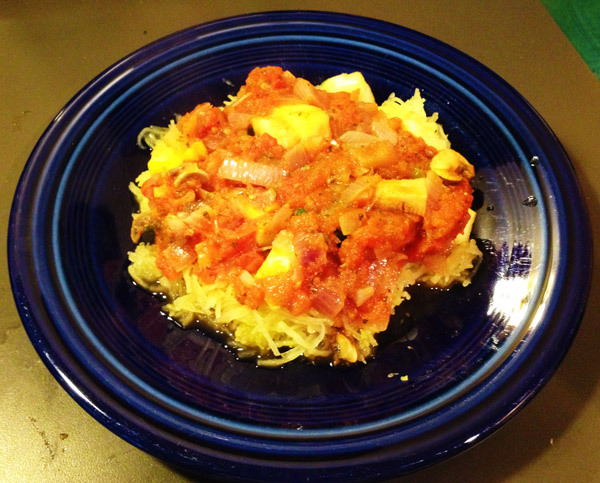 This is why I’ll be utilizing the often overlooked spaghetti squash! 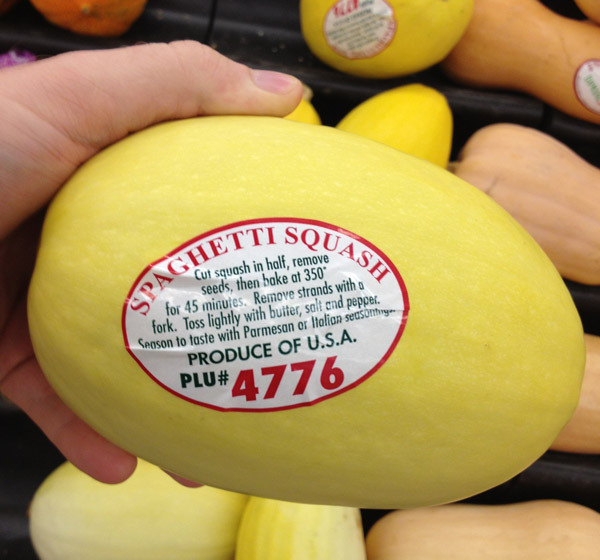 For those of you who don’t know what this is, the spaghetti squash is an oddity of nature. When you slice this squash in half and bake it, the flesh of the spaghetti squash comes apart in strands, resembling spaghetti noodles, and it has a slight buttery flavor. It still has the texture of squash, but if you close your eyes and imagine real hard, it’s almost like eating real spaghetti. It’s a great spaghetti substitute for those who are vegans, alergic to gluten, folks on a low carb diet, or even for those looking for a healthy and light alternative to the high-calorie traditional spaghetti. It’s good with a little butter and Parmesan or Romano cheese, and an Italian meat sauce. Since I can’t partake of any of that, I’ll have to settle for a tasty homemade marinara with mushrooms. And instead of meatballs, I’m cooking up some chopped zucchini and yellow squash. 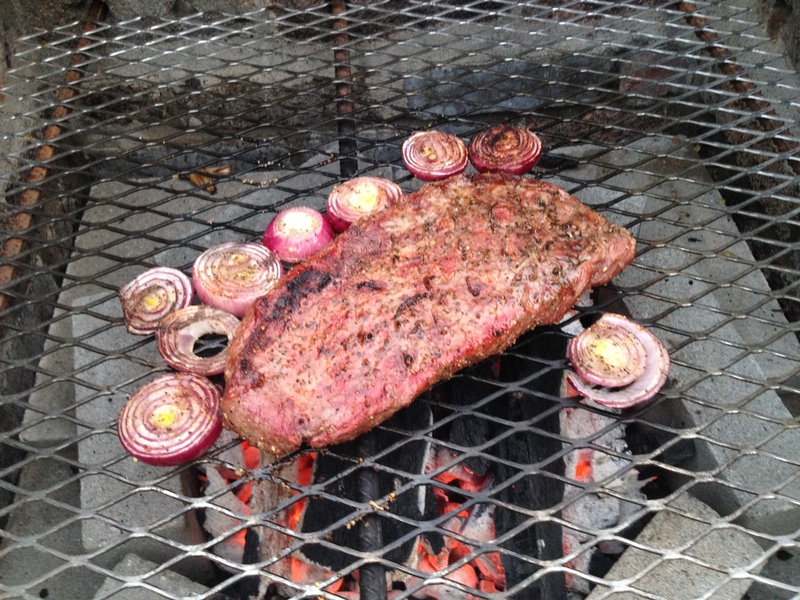 … O meat, how I miss you so! As it turns out, this is one of the better meals I’ve prepared during this diet. I think it ranks up there with my quinoa lettuce wraps. If you’d like to try your hand at this squashy spaghetti facsimile, you can find the recipe in the recipes section of the blog.